The exocrine part of the pancreas is composed of tubulo-acinar glands. The finest of the intralobular ducts are lined by a very flattened epithelium (thus difficult to recognize) which becomes cuboidal and columnar as the ducts increase in size. There are two to three main pancreatic ducts which enter the pars ascendens of the duodenum close to the bile ducts. The micrograph above shows a small duct with flattened epithelium and some centro-acinar cells can be seen. 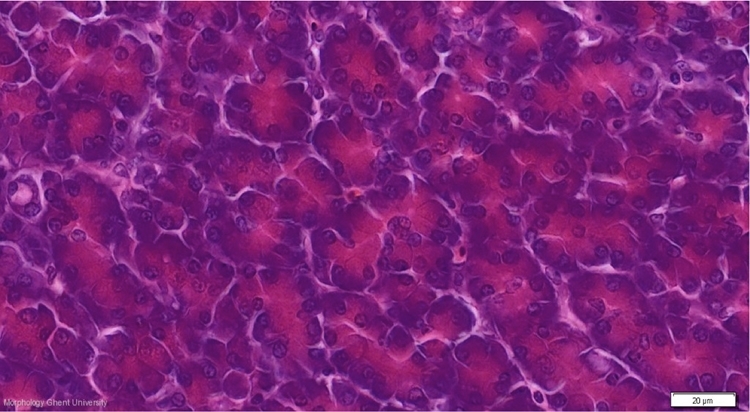 The exocrine pancreatic cells clearly stain basophilic in their basal part and have eosinophilic granules in their apical part.